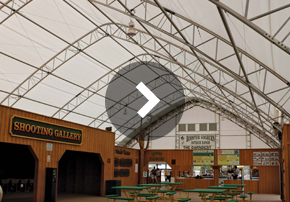 ClearSpan warehouse structures are a fast, economical solution for warehouse facilities. These warehouses can be temporary or permanent and offer unique designs that provide ample height and extraordinary clearance for your manufacturing and warehousing needs. There are no internal columns to interfere with forklifts, other heavy machinery or stored materials, allowing for easy movement and organization, as well as the maximum usable space. Our warehouse facilities provide an inviting environment that people enjoy working in, and the natural ventilation ensures that the facility always has fresh and clean air. 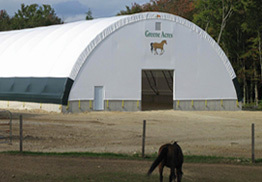 Warehouse facilities come in a number of shapes and sizes, and ClearSpan can create a building for any warehousing need. Our warehousing facilities come in fabric, hybrid and metal buildings, ensuring that no matter how you plan on using your ClearSpan structure, there is an ideal option.